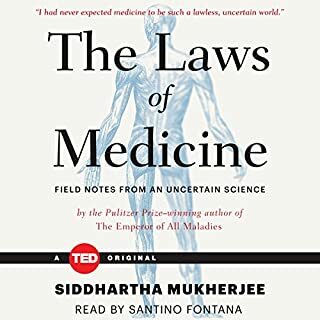 Siddhartha Mukherjee is a gifted story teller, a clinician who can navigate with utmost ease, zooming in and out of the daily practice of clinical medicine. His observations regarding practice of medicine in this book are insightful and provide a wholesome perspective, useful to a medical student, intern or a resident to shape his approach to medicine. However, compared to the expectations set by Dr. Mukherjee's previous work The Emperor of all Maladies, the current book may not be of as much interest to a general (non-medical) audience. At times the narrative seems to repeat- both in thoughts and quotes from the previous book. The "conclusions" that are drawn in this book from observing the patterns in clinical practice, are many a times so "obvious" to a clinician that the book may fail to stand to its own promising nomenclature as "the laws" of medicine.